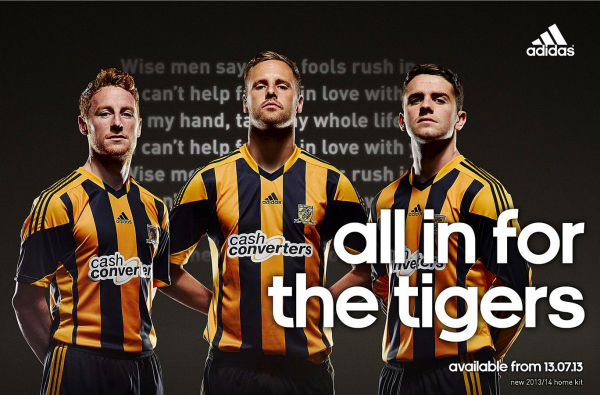 In order to avoid a colour clash when on the road, The Tigers have been known to mix and match elements of both home and away kits. Sometimes though, City kitmen have displayed a tragic lack of foresight and failed to take sufficiently distinguishable apparel, forcing the club to borrow pieces of kit from an opponent and take to the field bearing the home club’s crest. City tipped up to a snow covered Valley Parade for a Division 4 encounter evidently unaware that the Bantams home kit was white shirts, maroon shorts and white socks. Presumably City took white shorts with them thinking Bradford still wore black shorts at home, having paired white shorts with the home shirt the previous season at Tottenham and Sheffield United. 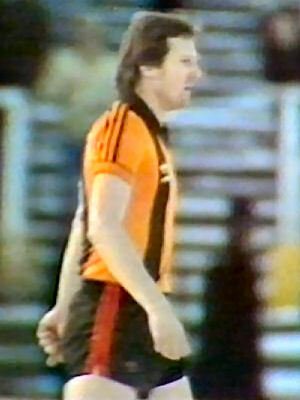 Thus City, whose home shorts were black, found themselves wearing Bradford’s black away shorts (as seen on Nick Deacy, above) for the 1-1 draw. City’s 3rd round FA Cup tie with top flight Watford took three games to decide, with The Tigers succumbing to a 1-0 defeat at Vicarage Road in a 2nd replay. 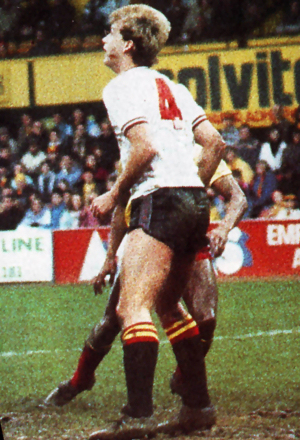 In the first game, a 1-1 draw, City borrowed Watford’s black away socks (Pictured right is Richard Jobson) as their own red change socks clashed with the legwear of The Hornets. 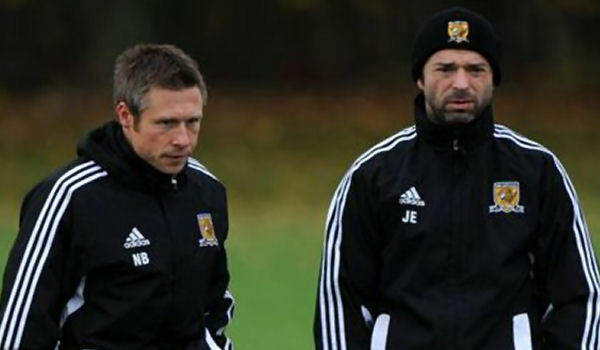 A replay at Boothferry Park failed to settle to matchup, ending 2-2 to set up another trip to Vicarage Road. City met a recently relegated Watford in the league the following season, again failing to realise red is part of The Hornets colour palette. 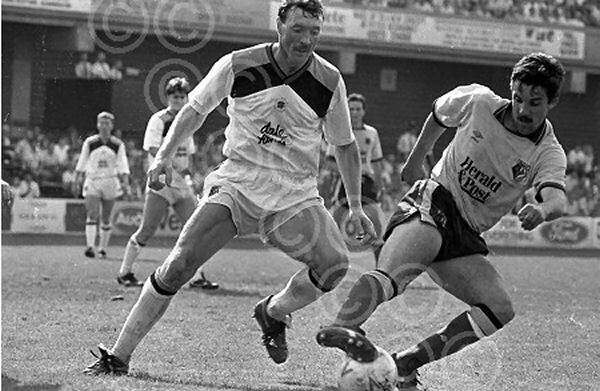 This time, City borrowed Watford’s white away shorts (seen on Mally Shotton, below). City ventured to far off Exeter to begin their 1999/2000 Nationwide League Division Three campaign. City’s purple and white away kit was yet to be delivered by manufacturer Avec, and facing a side pairing red and white striped shirts with black shorts and socks, player-manager Warren Joyce’s men could not don the garments intended to be worn with our home shirts. Instead they borrowed The Grecian’s purple away shorts and socks (purple was an inexplicably popular away colour choice that season), teaming them with black and amber (as seen on Colin Alcide and Warren Joyce, above). Not a strong look. A kit clash is all in the eye of the beholding referee it seems. 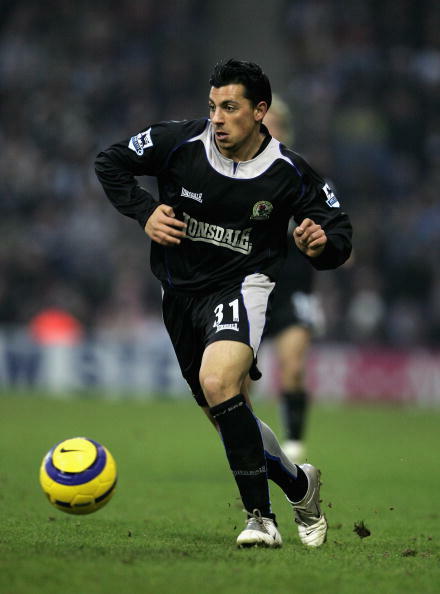 City’s 2001/02 away kit of silver shirts with navy blue shorts and socks wasn’t deemed too similar to Derby County’s white shirts and black shorts when we played at a still gleamingly new Pride Park in a League Cup tie. 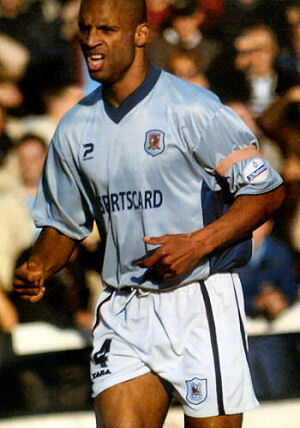 The man in charge of Darlo v. City, Mr. MJ Jones, evidently thought that silver and navy blue did indeed clash with white and black, and since City had failed to take alternate shorts with them to Feethams, asked The Tigers to wear the Quaker’s white Xara away shorts with our silver shirts (seen above on Justin Whittle, who appears to be using an elastoplast as a captain’s armband). Poor Rodney Rowe, he wore number 9 for City that year and was given the Darlo number 9 shorts with little consideration given to sizing, they were a little bit snug and his movement appeared constricted somewhat. It might have been a better idea to have Darlington wear the white shorts, as they worked with their white home shorts, though it all became a moot point halfway through the first half when the referee ordered a change, forcing Darlington to wear their red away shirts and sparking unseemly scenes of shirts being lobbed back and forth, sidelines to pitch, and players changing on the pitch. 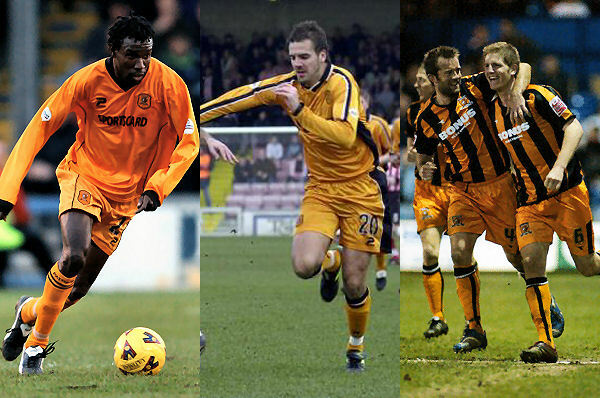 After this game, City had manufacturer Patrick knock up two sets of alternate shorts, one set amber (used at Lincoln and Luton), the others silver (used at Oxford) to avoid a similar happenstance. City’s menacing black away kit was popular with fans and players alike, so we used it on our travels even when the home team’s kit clashed not one jot. 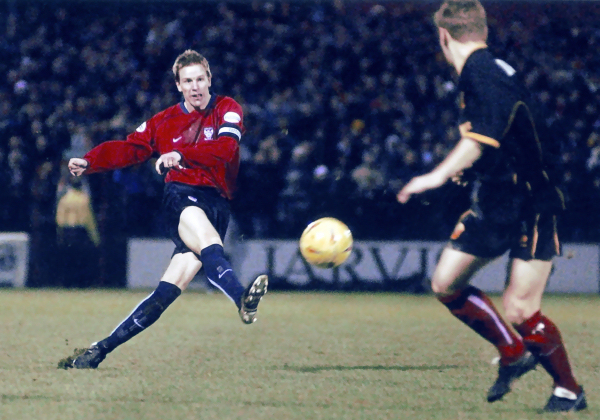 We took it to Bootham Crescent (it hadn’t yet been renamed, *guffaw*, Kit Kat Crescent) not realising The Minstermen used navy blue socks with their red shirts and navy shorts, so The Tigers sported York’s red socks for the Boxing Day clash (as seen on Andy Dawson, below). Our most high profile episode of kit borrowing came in our first Premier League season. Ahead of the game, some fans openly wondered online what we’d wear at Newcastle as the flint grey away kit didn’t offer much distinction from the Geordie’s black and white duds. Not that our kitman thought about that, we could have taken the all white kit from the previous season (made by Umbro, sponsored by Kingston Communications as was the 2008/09 away shirt, and used when we returned to St. James Park in the FA Cup later in the season) but didn’t, so instead we used The Magpies’ white away shorts and socks for the 2-1 win (as seen on Dean Marney, Ian Ashbee, Marlon King, Peter Halmosi and Andy Dawson, all below). Kit borrowing is by no means a practice unique to City, for example Chelsea once wore Coventry’s red and black chequered away shirts at Highfield Road after their dozy kitman failed to recognise a lack of contrast between sky blue and royal blue. 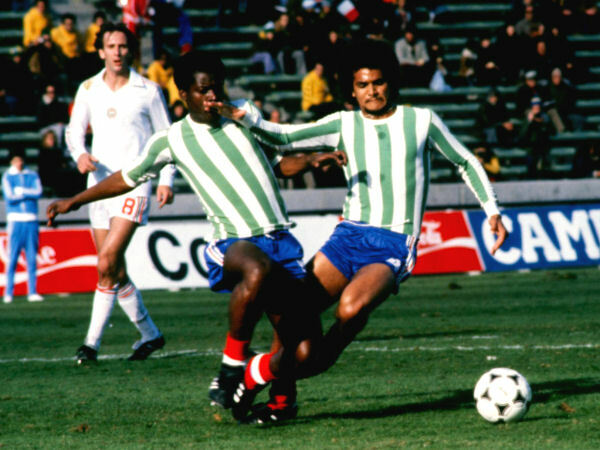 Perhaps the most famous instance of impromptu kit replacement came in the 1978 World Cup when France donned Argentinean club side Kimberly’s green and white striped shirts to face Hungary (seen below), so viewers watching black and white television sets could tell the difference between the sides. The amber shorts and socks set are sure in vogue at the moment. Following their first use together with the home kit at Derby on Saturday, the Reserves used the same combination v. Gateshead Reserves on Monday night for a 4-1 win at the Gateshead International Stadium. Picture from Gateshead’s OWS. The Tigers today revealed an amber alternate shorts set in the 2-0 win at Pride Park, pairing them and amber socks with the home shirt. It was a smart move by kitman John Eyre, as the Argentina blue away shirt doesn’t really provide adequate contrast with the white shirts of Derby County. 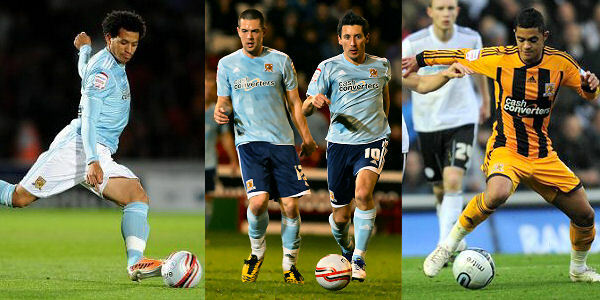 The amber socks we’ve seen before, they were used in the pre season friendly against Bradford, but it was a debut for the amber shorts, which are a chromatic inversion of the black home shorts. 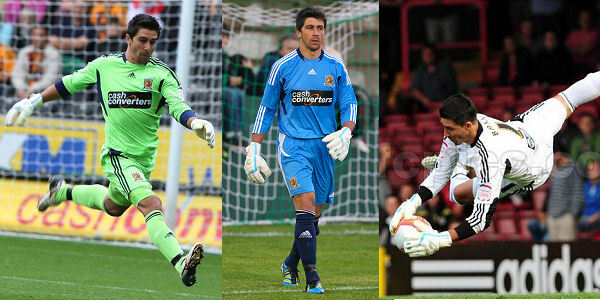 City have used amber alternate shorts and socks several times before, in 2001/02 at Lincoln and Luton in November 2011 (As seen on Theo Whitmore, below left), in 2003/04 at Lincoln (modelled by Lee Marshall, below centre) and in 2006/07 at Luton (seen on Ian Ashbee and Michael Turner, below right). 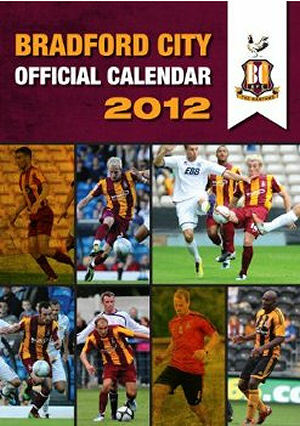 Familiar faces appearing on Bradford City’s 2012 calendar should come as no surprise, given that ex-Tigers Craig Fagan, Jamie Devitt and Matt Duke are all currently plying their trade at Valley Parade, but Dele Adebola in a City kit? Shurely shome mishtake? The Adebola picture was taken during a Bradford game at least, the late July pre-season friendly at the KC Stadium in which the West Yorkshire lot wore their garish pink away kit, while City paired some fetching amber socks with the rest of the home kit. Bring them back!